I have thoroughly enjoyed writing Ann’s Entitled Life this past 9 months, and plan on keeping it up next year! This is definitely a change of pace from Coupons, Deals and More; especially the part where I write so honestly about our lives, I have really come to love “lifestyle” or “content” blogging. 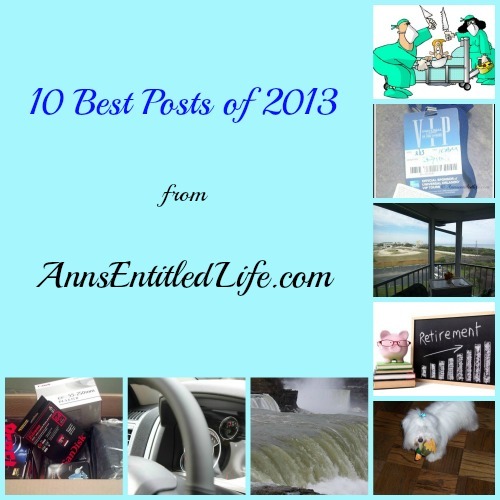 Below are the 10 Best Posts of 2013 from Ann’s Entitled Life. This is purely subjective on my part. While some of these are highly trafficked, most are very personal and an integral part of who I am, and what Ann’s Entitled Life is all about. • Welcome to Ann’s Entitled Life! • I Bought A Camera! • What Does Retirement Mean To You? I would like to thank you all for reading, following, and commenting on Ann’s Entitled Life. Without your support, I would have no reason to blog.